You get 2 versions of the video, edited to different lengths: 3 minutes and 6 minutes. That way it’s flexible to fit into your lesson plan. 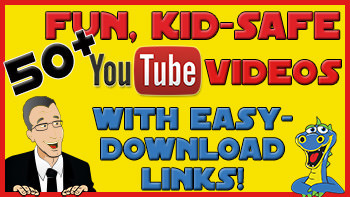 And you can download it in two different formats – MP4 and WMV – so you know it will work with your technology. Of course, helping kids get to know God better is the foundation underneath all of our lessons. And I used lots of curriculum that talked about how important it is to get to know God better. But this is what I heard: The kids in my children’s church left church wondering – “Okay, it’s important, but HOW do I get to know God better?” That’s what this children’s church video is about. You can use this children’s church video to INTRODUCE your lesson about getting to know God better. And then follow the video with a DISCUSSION about specific ways to do that. By spending time together talking. That seems hard to do with God, since He’s invisible. But… by reading the Bible we can hear from God. And through prayer, we can talk to God. It’s a different way to have a “conversation” than we’re used to, but it kind of makes sense that talking to God would be different than talking to another kid at school. It seems different because we can’t see Him, but when we spend time in prayer and the Word, we are literally “hanging out” with God. In fact, James 4:8(NIRV) says, “Come near to God, and he will come near to you.” Isn’t that great? I LOVE that God wants to meet with us! And I hope that sentiment comes through clearly in this little children’s church video. By swapping stories. For example, when my kids were little, they loved hearing stories about my wife and I. But they never asked us to list our best personality traits, or asked for a resume’ of our schooling. They always said, “Tell us a story of you growing up.” Stories tell you more about a person than any list could ever convey. And notice that God has revealed Himself to us in the same way, through stories. The Old Testament is full of stories: Adam and Eve. God and Joseph and his family. God and Moses and Pharaoh and the plagues. And on and on through the whole Old Testament. And then the New Testament starts off with FOUR versions of the story of Jesus’ life. And then the story of the early church. We’re so fond of 3-point lesson plans that say God is omniscient, omnipotent, and omnivorous (or something like that). But that’s not how the Bible reads. It’s more like God has invited us to listen in to His family stories and get to know him that way. Think of the Bible as family stories to help us know God better, like that time Sarah laughed at God! Or remember when Jacob wrestled God! That tells you a lot about our amazing God. So I encourage all of the kids in Children’s Church to really pay attention, and enjoy, the stories in the Bible, and look at what each one tells you about God. That’s a great way to get to know Him better. And especially look at stories of Jesus. To introduce this topic in my children’s church lessons, I like to think about H.G.Wells’ book The Invisible Man. We think invisibility would be cool – you could eavesdrop on any conversation, etc. It sounds wonderful, but it completely cuts The Invisible Man off from relationships with anyone. He can’t talk to anyone without them freaking out at the disembodied voice. He can overhear secrets, but he has no one to tell them to. The Invisible Man has to make himself un-invisible by wearing clothes and facial bandages in order to try to get back in fellowship with the human race. Consider that – He has to become un-invisible to have relationships with humans. Does that sound at all like Col 1:15, “He is the image of the invisible God, the firstborn over all creation”? Why did Jesus take on a body? So that we could relate to Him, and therefore get to know Him better. What a gracious God we serve. If this Children’s Church video can help you introduce or illustrate these concepts in any of your lessons, I hope you take advantage of it! 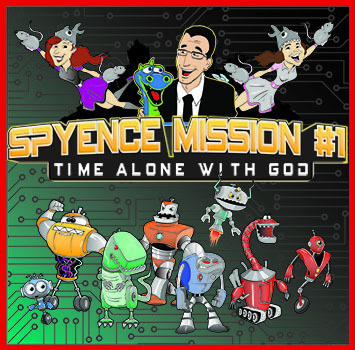 And while you’re here, click on the robot if you want to see what happens when Spyence Headquarters teaches kids about quiet time with God! And finally, if you can think of anybody else who might be able to use this video, please share and tag them using one of the buttons above. Thanks! Curt: That right, to help kids get to know God better. Bob: Like in Psalm 34:8! Bob: And secretly put 3 Skittles in each bag! Curt: That’s right, we didn’t tell these kids, cause we wanted to see their reactions when they were expecting an M&M, but bit into a skittle instead. Kid: Pastor Curt, these, um, Are really cool. Kid: Yeah! They had skittles on the top and M & M’s on the bottom. I think I ate a Skittle. I found a skittle in this. Kid: I found a skittle in this and I ate it. There was a skittle in this! You said these are M & M’s! These are not M & M’s! These are Skittles. Kid: No, they’re skittles. That’s another one! That was a skittle! I’m a very picky candy eater, so I know everything. Curt: How are those M & M’s? Curt: They all taste good? They all taste right? Kid: There’s like – there’s a… squishy ones in there. Um.. what is it called? 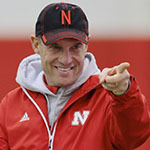 Curt: No? Not life fruit. Could it have been a jelly bean? Curt: It was a jelly bean? Oh my! There was a jelly bean in your M & M’s. Or a skittle? Could it have been a skittle? Kid: Oh yeah! It was a skittle. Curt: There was a skittle in your M & M’s! Curt: Yeah, and what was the point, Bob? Bob: God tastes like a Skittle! Curt: No, the point is you can learn a lot by tasting something. Curt: Well, even though skittles and M&M’s look almost exactly the same, all those kids could tell they were different just by tasting them. Bob: So you should take a bite out of God! Curt: No! Here’s the point: God wants each of us to really get to know Him, and experience Him. Curt: In other words, God wants us to get a taste of how wonderful He is. Bob: A taste of how wonderful God is? Curt: No, it’s like God wants us to do our own taste test so we can see for ourselves how wonderful He is. Bob: And how do you do a taste test on God? Curt: Well, if you’re ready to ”taste” how good God is, you spend some time with Him. Bob: Yeah, go to the mall with God. Bob: Play checkers with God. Curt: No… maybe read a few verses from a kid’s Bible, and talk to God about your day. Your leader can tell you more about it. Bob: Good idea – talk to your leader! Bob: From Downton Abbey’s Pineapple Under the Sea! Bob: Cause God’s about to blow your mind!